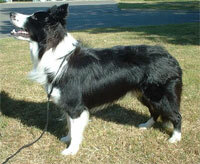 The border collie has been known to suffer from progressive retinal atrophy, ceriod lipofuscinosis, joint problems. It is important that when contacting a Border Collie breeder that you express health concern issues and ask the breeder what they are doing in order to help mimimize them. Please don't purchase your Border Collie from a petstore which commonly are known to support Border Collie puppy mills. Doing so only promotes inproper breeding ethics and promotes current Border Collie health issues. The AKC, UKC, FCI, CKC, SKC, WWKC, FIC registries recognize the Border Collie breed standard. Country of Origin: Great Britain; probably remains closest in type to the generic . Character: Intelligent, determined and brave, this dog forms a close bond with its family and is also eager to work. Temperment: This dog gets along quite well with other pets and children, provided it has plenty of activity to keep it occupied. Coat: White should not be predominant, however all colors are acceptable.The most common color combination is black with white markings. The undercoat is thick, medium-length, and shiny. Care Weekly brushing of the coat should keep it in good condition. Comments: By the Renaissance, the Bolognese had become a favorite of the nobility. Even ten year olds play like puppies; they are fearless and love people. They are healthy quiet dogs with acute hearing and eyesight. While not barkers, they make good watchdogs. .